Tags: Astrology of First Thanksgiving and Thanksgiving. The first Thanksgiving was held over a period of several days starting on October 16, 1621. The conjunction of Neptune, the Sun and Mercury in the socialized sign of Libra and in the diplomatic ninth house were good signs that a compassionate meeting of the minds was possible. In addition, the Moon Venus conjunction in Scorpio in the ten house of government brought deep emotional connections among the participants. A cold winter was coming and this was a time of true gratitude for the abundance that would hopefully see them through. 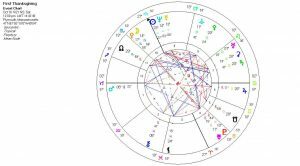 The one rather ominous setting would be the retrograded Pluto and Juno down in the fourth house of home and roots. Sadly, this feeling of brotherhood and sharing would be violently shattered in the New World. Still, we celebrte the essence and hope of this first Thanksgiving every year. Hopefully, we can live up to what it represents. In the mean time, Happy Thanksgiving.